drained in August may look like a swamp in March and April. To learn about soil drainage, we need to talk a little about soil types. 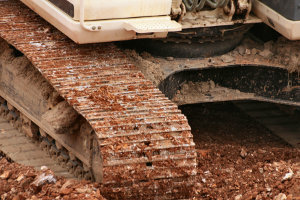 There are three basic types of soil- clay, sand, and silt. All other types of soil, including loam, are combinations of these three. Clay soil has small pores that hold water. Sandy soil has large pores that allow water to drain freely, and silt soils have fine flour-like particles. Feeling the soil with your hand is a good way to get an idea of your soil type. Clay soils are sticky, sandy soils are gritty, and silt soils have a soapy feel to them, but are not sticky like clay. So what does that all mean, isn't water good for your garden? Like everything else in life moderation is the key to having a good garden. In order for most plants to flourish, the roots need to absorb carbon dioxide from the air in the soil. 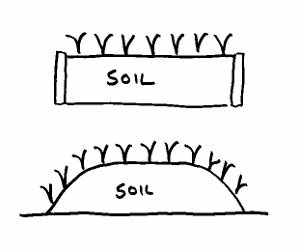 If the soil is mostly clay, it will have no large pores to allow air to get to the roots. This can result in a condition called "chlorosis." This condition causes leaves to yellow and drop off. There are a number of ways that you can improve soil drainage. Drainage pipe can be buried under the soil if there is a place for them to drain excess water to. Water that comes down a slope can be intercepted utilizing French drains. These are essentially ditches that are dug perpendicular to the flow of water. There is a perforated drainage pipe placed in the bottom and the ditch is filled with gravel. Now, most home gardeners are not going to go to the expense of installing drainage systems due to the cost and effort needed, so they need to find an easier way. One of the easiest ways for the home gardener to improve soil and soil drainage is by using lots of organic material in the form of compost and raising the level of the garden so that the proper drainage is created. One mistake that new gardeners make when they try to deal with clay soil is to add sand with the idea that it will help the soil drain better. What actually happens, however, is that the soil becomes even harder and more inhospitable to your plants. Adding compost will help to break up the clay by adding organic material. As the organic material mixes with the clay, it helps to break it up and when the organic material decays it leave voids through which the roots can breathe. Raising the level of the garden will also aid proper drainage. The use of raised beds, either contained or left open, raise the level of the plants above the poor soil, increasing drainage. An added benefit is that raised beds tend to warm quicker in the spring. As you can see, there are solutions for improving drainage that range from simple to complex. Unless your garden site is a complete swamp, using raised beds may be the most economical in the long run. Like most soil improvement projects, the time it takes to do it is in direct proportion to the amount of money that you want to spend.